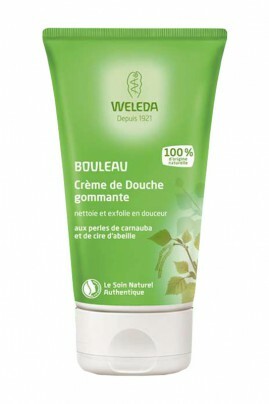 The Weleda Body Scrub Shower Cream contains an extract of organic birch leaves, known for having purifying and detoxifying effects, promotes radiant skin that looks and feels completely refreshed. Vegetable-based cleansers free of synthetic detergents ensure even sensitive skin gets gently cleansed. Natural plant wax pearls and pure organic and natural plant oils massage your skin, supporting skin renewal without drying or disturbing your skin’s natural balance. Organic sesame seed oil and apricot kernel oil, rich in essential fatty acids, promote radiant skin that feels and looks refreshed. Your skin soaks up this unique complex of skin-replenishing nutrients and feels naturally refined and silky smooth. Gently exfoliate rough surface skin with Weleda Birch Body Scrub to reveal the regeneration of a pure, naturally refined, beautiful you. La texture granuleuse fine et l'odeur sont très agréables... seul chose à faire attention, ne pas le laisser à moitié pendant longtemps parce qu'il s'abîme vraiment vite. Massage Weleda Birch Body Scrub & Shower Cream with circular motions to the body with a loofah or hands and rinse thoroughly. For best results, use in combination with Weleda Birch Cellulite Oil. Water (Aqua), Coco-Glucoside, Sesamum Indicum (Sesame) Seed Oil, Alcohol, Disodium Cocoyl Glutamate, Beeswax (Cera Alba), Copernicia Cerifera (Carnauba) Wax, Hydrogenated Castor Oil, Prunus Armeniaca (Apricot) Kernel Oil, Glycerin, Fragrance (Parfum)*, Chondrus Crispus (Carrageenan), Betula Alba (Birch) Leaf Extract, Ruscus Aculeatus (Butcher's Broom) Root Extract, Rosmarinus Officinalis (Rosemary) Leaf Extract, Xanthan Gum, Lactic Acid, Limonene*, Linalool*, Citral*. Odeur fraîche et douce, texture agréable. Bon produit. Odeur et texture très agréable. Efficacité validée: tout bon!